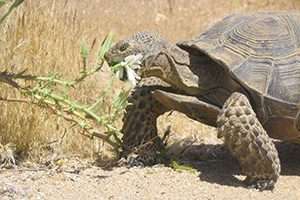 Results of a study on the relocation of a community of desert tortoises in California has unveiled a mystery: When moved only a short distance from their habitat, the females in the group assimilated to their new location and reproduced normally – but not the transported males. The study originated in 2008 with a planned expansion of Fort Irwin National Training Center in the Mojave Desert. But the expansion area included a swath of prime habitat for the endangered desert tortoise. So the U.S. Department of Defense funded relocation of the tortoises to an area adjacent to the base that is less than 10 miles south of their previous home. The Smithsonian Institute's National Zoo and Conservation Biology Institute has completed parentage analysis after the relocation and has found that none of the transported males had sired any offspring. In contrast, all the moved females and the resident tortoises had adjusted well and reproduced. "These results were really surprising," said Emily Latch, a UWM associate professor of biological sciences and a co-author of a paper published May 24 in the journal Biological Conservation. "We fully expected that after several years, all tortoises would be reproducing at 'regular' levels. Our radio telemetry data indicated that translocated males were in the vicinity of females, and so had access to mates." Translocation is common conservation strategy, used to increase genetic diversity among populations and move threatened animals in the case of habitat loss. Latch, who worked on the early stages of tortoise project as a post-doctoral researcher with the Smithsonian, has also worked on translocation projects involving species of wild turkeys, mule deer, bison, bighorn sheep, river otters and fishers. These findings, she said, suggest that for some species, translocation may not be as effective a tool to rescue populations at risk as previously thought. Kevin Mulder, a graduate student at the Smithsonian Conservation Biology Institute and first author on the paper, said more research is necessary to identify what may have happened.